I’ve been asked many times how I get the fine speckles of colour in my paintings so I am going to let you into the secret. I lay the painting flat on a table and using the edge of a palette knife I scrape flakes of pastel on the surface where I want to create the effect of small leaves, seed heads in a field or sea spray on rocks etc. I than press the flakes into the painting with the flat of the palette knife. If there are some stray flakes which you do not want, you simply don’t press them in and they will either fall off when you place the painting in a vertical position or you can blow them away. Step 2. 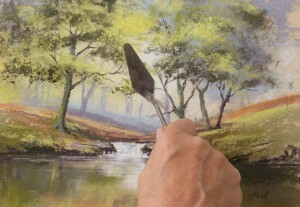 Press the flakes into the surface of the painting with the flat of the palette knife where you want them to stick. Blow away any unwanted flecks. Step 1. Lay the painting horizontal on a table and using the edge of a palette knife, scrape flakes of pastel from a pastel stick on to the surface of the painting where you want to create fine specks of colour. This technique is most effective if you use contrasting tones and colour. It is almost impossible to achieve these fine marks with a dotting technique and the random effect is particularly pleasing. However, I will issue one word of warning. This technique is addictive and it is easy to get carried away using it all over the place and then the effect is spoiled.This technique is described in my book Painting with Pastels and demonstrated on my DVD of the same name. Or you can buy both at a Special Offer Price of £20. This entry was posted in Jenny Keal Blog, jenny keal pastel., pastel, pastel demonstration, pastel painting, Uncategorized by Jenny Keal. Bookmark the permalink. Jenny, is your dvd compatable for USA dvd players? I have & love your book mentioned above, love your work. The dvd’s will play in the USA on multi region dvd players and on computers but if you wish to be sure you can order a NTSC version, by sending me a message with your order.